When the shimmery signs for the new pop-up shops went up on Thor Equities’ retail building on Stillwell Avenue, a sign with larger lettering promising ARCADE and a Steeplechase Park Funny Face, Coney’s symbol of merriment, took center stage. But there is no amusement arcade with coin-operated games in Joe Sitt’s “Retail Ride of a Lifetime” Building in Coney Island. It’s a phantom. 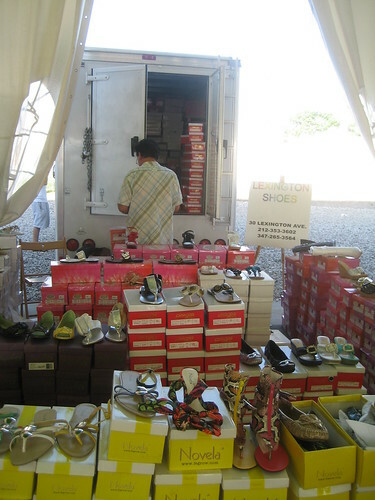 The door, decorated with a sign advertising Retail Space Available, leads to a vacant space, maybe 10 by 15 feet, that would fit several machines at the most. Sources tell ATZ the arcade use was required to obtain the C of O for the building from the City. Why not get it up and running? Joey Coney Island’s Arcade! 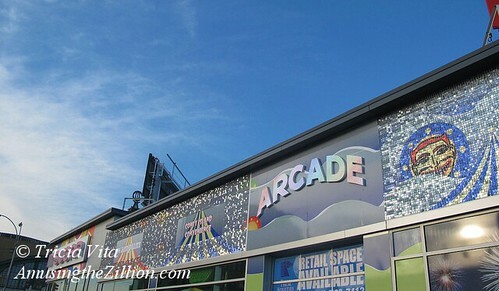 There are actually two of these phantom arcades –one on the Stillwell Ave. side of the Building, the other on Surf next to It’Sugar candy chain. Before the season got underway, at least three Coney Island amusement operators were approached to put games in the building. Sources say an agreement could not be reached because Thor wanted a high rent and the amusement operators proposed revenue sharing, which is standard for owners of arcade equipment placing machines in restaurants and retail locations. Ironically, all but one of the retail tenants in the new building are believed to have revenue-sharing arrangements in lieu of rent, according to the Coney Island Rumor Mill. 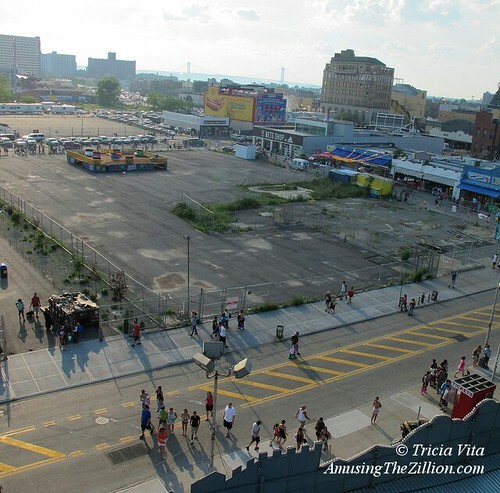 On either side of the tiny nonexistent “arcade” are 2,500 square foot retail spaces, the maximum allowed by the Coney Island Rezoning of 2009. 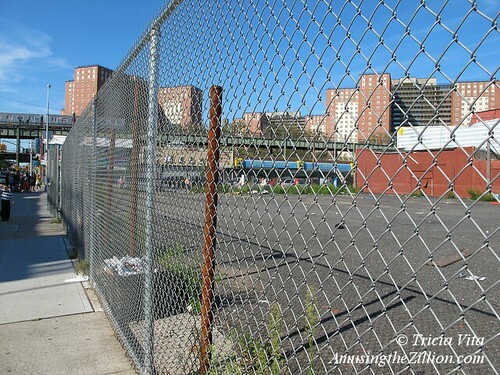 However, the zoning requires that “At least 15 percent of the Stillwell Avenue and West 10th Street street frontage of any zoning lot shall be occupied by Use Group A1 uses at the ground floor level.” A measly 15 per cent! 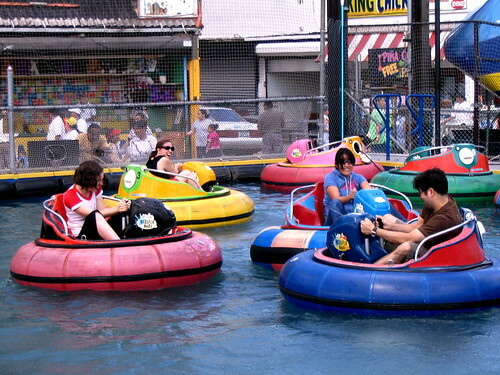 “A1” includes amusement arcades as well as open booths with games of skill or chance, such as water racing and shooting galleries, which used to occupy the spot in the demolished Henderson Building where the Brooklyn Nets Shop is now. Use Group C, which covers retail and service uses, is what we can expect to see more of in Thor’s Coney Island. The pop-up shops include clothing and T-shirt boutiques Wampum NY and Brooklyn Rocks, Coney Island Convenience Shop, and the Brooklyn Nets Shop on the Bowery. 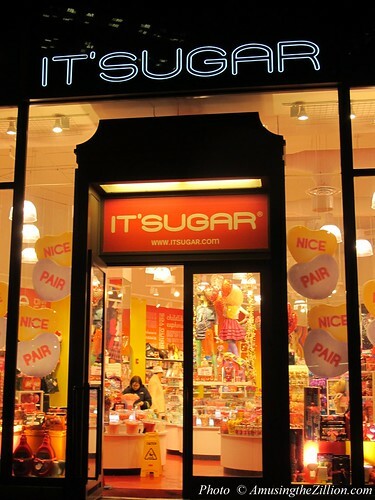 Candy retailer It’Sugar on Surf Avenue is believed to have a longer lease. 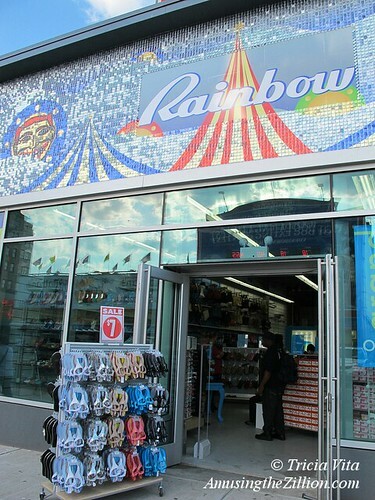 The next chain store to arrive in Coney Island’s amusement district is Rainbow, which sells clothing for juniors, plus sizes, and children, as well as shoes. They’re set to open on the Stillwell side of Thor’s building, across the street from Nathan’s Famous. 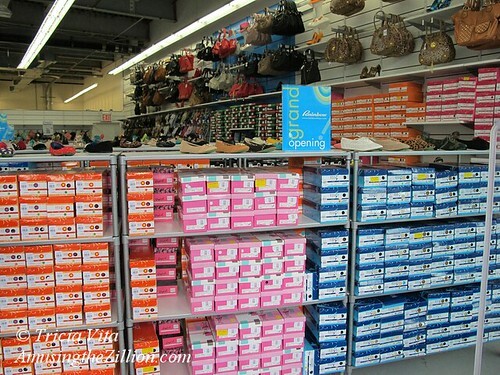 The Brooklyn-headquartered retail chain has 28 other stores in Brooklyn and over 1,000 locations nationwide. Other chains coming to Coney Island are Applebee’s, Johnny Rockets, Red Mango and Checkers franchises, which signed leases with various property owners on the north side of Surf Avenue. 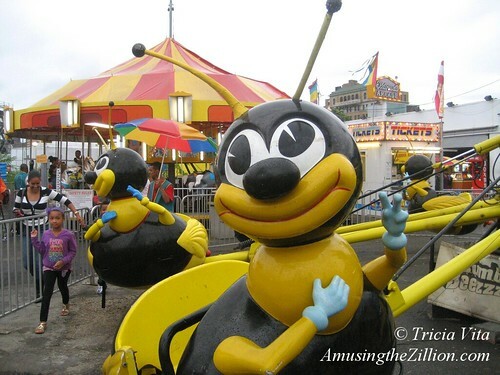 Until the early 1980′s that side of Surf was home to individually-owned penny arcades and a variety of rides including bumper cars, carousels and even a Jumbo Jet-style coaster. 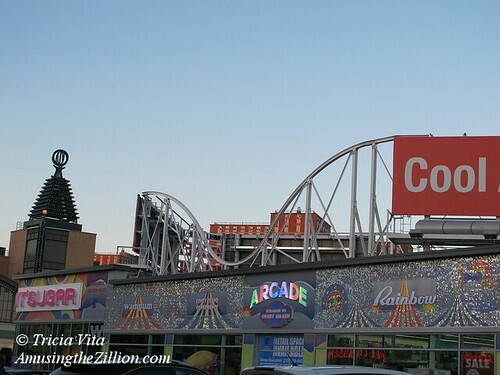 The last ride on the north side of Surf– Coney Island’s B & B Carousell —closed in 2005 and is now located in the new Steeplechase Plaza on the Boardwalk. Nobody ever said life was fair, but the first word that comes to mind here is DESPICABLE. Remember Maritza, who was evicted from Thor Equities soon-to-be demolished Henderson Building in 2010? She’s had a souvenir store in various spots in Coney for oh, about 25 to 30 years. 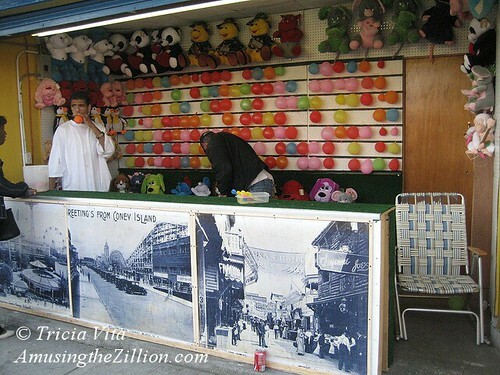 ATZ wrote about her again in April when she moved her gift shop/convenience store into Thor’s Retail Ride of A Lifetime building (“Thor’s Coney Island: Evicted Souvenir Shop Returns to Its Spot,” ATZ, April 19, 2013). Well, it turns out Maritza is the ONLY one in Thor’s building who is actually paying rent, in the tens of thousands of dollars, too. The veteran shopkeeper was not offered the 15 per cent of sales deal that the brand-name newcomers from small shops like Wampum NYC and Brooklyn Rocks to the chain It’Sugar and the Brooklyn Nets Store were given. Guess we’ll have to go back and update the December post about Joe Sitt’s press release “To Add Local Flavor To Coney Island By Leasing Major Surf Avenue Parcels To Local Brooklyn Merchants At Reduced Rents For 2013.” There’s nobody more local than Maritza. Rip up the lease and give her the break you’re giving everyone else, Joe! 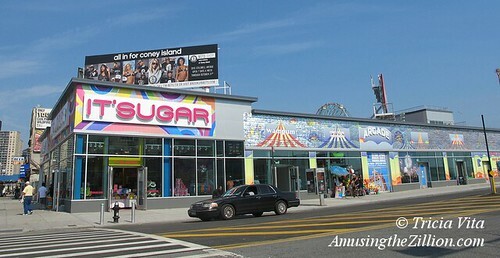 In 2011, Thor Equities put up new signage atop the blue construction fence at the corner of Surf and Stillwell Avenues, the gateway to Coney’s beach and Boardwalk amusement parks: “CONEY ISLAND – The RETAIL RIDE of a LIFETIME.” After eight years of real estate speculation and the rezoning of Coney, Thor CEO Joe Sitt’s retail ride finally begins this season. ATZ has learned exclusively from sources that candy retailer It’Sugar will be the first tenant at Thor’s new building at Surf and Stillwell. The plywood has come down from the boarded-up new building, which was completed last January, and interior construction of the corner store is underway for a May 3rd opening of It’Sugar Coney Island. The Florida-based company was founded in 2006 and is “one of the largest and fastest growing specialty candy and gift retailers in the world with over 70 retail locations,” according to one of their press releases. 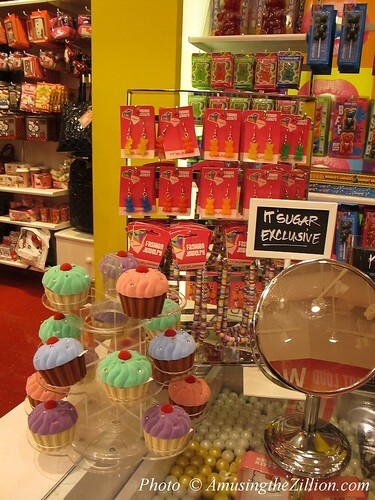 ATZ went to the It’Sugar store on Manhattan’s Upper West Side to check it out. The place is pink ‘n’ yellow with a sparkly garnet floor and the music is blaring. It’s impossible not to smile at the sight of a supersized, one pound pack of Reese’s peanut butter cups and a one pound Hershey’s chocolate bar paired for Valentine’s Day until you look at the price tag — $40. There’s also a kiosk of old school candy like Necco Wafers and Goo Goo Clusters, jewelry that looks like sweets, T-shirts and novelty items. Among the candy retailer’s other locations are the Atlantic City Boardwalk, San Francisco’s Fisherman’s Wharf, the Grand Canal Shoppes at the Venetian in Las Vegas, Universal Citywalk in California and malls from Alabama to the United Arab Emirates. There are also 22 “shops in shops” in Macy’s including Herald Square and such New York City tourist destinations as Madame Tussaud’s and Radio City Music Hall. The upscale candy store will be the first sight visitors see when they exit Stillwell Terminal and will open in a Coney Island that is rapidly changing. Three national franchises– Applebee’s, Johnny Rockets and Red Mango–have signed leases for the north side of Surf Avenue, on property not owned by Thor. 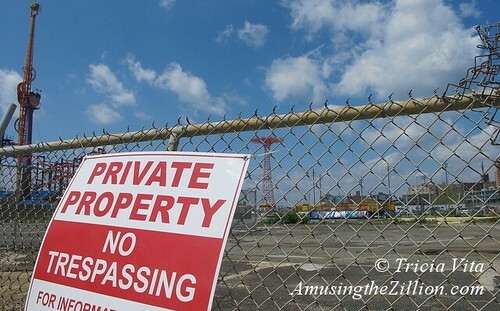 If you’re a regular reader of ATZ, you’ll know we’re not a fan of the plan to “revitalize” Coney Island by bringing in formula businesses and franchises. As we’ve written previously: Coney Island, the birthplace of the hot dog, the roller coaster, and the enclosed amusement park is famous for its quirky authenticity, but it’s about to look and taste more like Anyplace USA. A press release from Thor Equities offers potential good news for Brooklyn retailers and restaurateurs who’d like to open a pop-up store or get a foot in the door of the new Coney Island: “Thor To Add Local Flavor To Coney Island By Leasing Major Surf Avenue Parcels To Local Brooklyn Merchants At Reduced Rents For 2013.” The idea is to fully lease Joe Sitt’s new building at Surf and Stillwell for the summer of 2013. Vacant since its unveiling last January, the sterile looking building was soon boarded up with plywood. It is currently dressed up with a Funny Face mural and a sign advertising “CONEY ISLAND – The RETAIL RIDE of a LIFETIME” with a phone number to call for leasing opportunities. As ATZ reported last week, Johnny Rockets, Red Mango and Applebee’s franchisees recently signed leases with property owners on the north side of Surf, where sources said the rent was one third the price of Thor’s building on the south side. How enticing is Thor’s rent reduction? “While each location within the 15,000 square foot property is taken on a case-by-case basis, generally Sitt is reducing each unit in the vicinity of about 40 per cent,” Thor spokesperson Jaclyn Rothenberg told ATZ. “The building is divided into four storefronts. 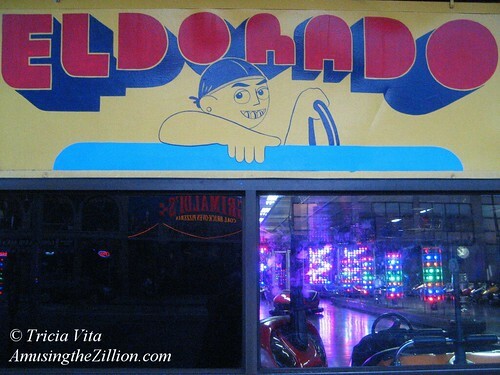 Three are vacant and one has been leased to a national company.” In addition, the Eldorado Bumper Cars and Arcade, which is a couple of doors away in a building purchased last year by Thor Equities, will also be the beneficiary of a rent reduction. This couldn’t have come at a better time since the Eldorado was damaged by Sandy and needs costly repairs to reopen. On December 15th, Thor Equities filed plans with the Department of Buildings for general construction for a new retail build-out inclusive of partitions and installation of mechanical equipment, duct work and plumbing fixtures. The original floorplan for 1232 Surf promised more than a dozen spaces including a row of 250-square-foot spaces on the Bowery side, outdoor seating on Henderson Walk and a 3,050 square foot roof deck. Thor is teaming up with the Brooklyn Chamber of Commerce to help recruit tenants, according to Chamber president Carlo Scissura. “This program is especially important in the aftermath of Hurricane Sandy and will go a long way in making sure that Coney Island remains a vibrant neighborhood and tourist attraction as well as a place where small businesses can thrive and Brooklynites can get jobs,” said Scissura. In the documentary “Zipper,” Joe Sitt reads a list of national chains that he wants to bring to the new Coney Island. It sounds like Any Vacation Spot USA: Ripley’s Believe It Or Not, Dave and Buster’s, Hard Rock, Rocky Mountain Chocolate Factory, Howie’s Game Factory, Build-A-Bear Workshop. Has Sitt, who was reviled in 2008 as the Grinch who stole Coney Island for locking out small business owners on Christmas Eve, evolved into a Santa for Mom-and-Pops? Hey, we hope so. Only time and the new building’s tenants will tell. 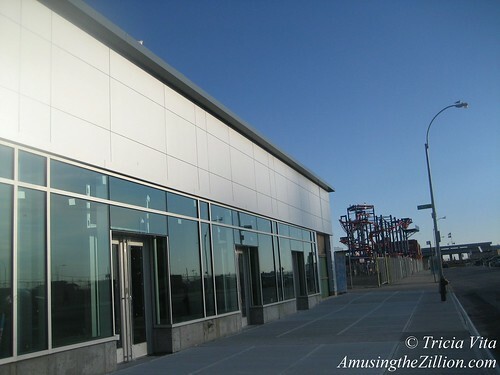 The one-story building at 1232 Surf Avenue is Thor Equities’ first new construction in Coney Island. It was built on the site of the century-old Henderson Music Hall, which was doomed when the City rezoned the parcel for a high-rise “hotel” in July 2009. The City’s Landmarks Preservation Commission denied landmark designation and also declined to create a historic district, which would have created tax incentives to rehab the building. Henderson’s began as a restaurant at Bowery and Henderson Walk in 1881 and included a music hall featuring such music and vaudeville acts as Al Jolson, the Marx Brothers, and Sophie Tucker. From 1926 to 1984, the building housed the World in Wax Musee. Tenants who lost their leases after Thor bought the property or due to the demolition in 2010 include the Velocity Nightclub and Popeye’s Chicken, which has since relocated to the Popper Building. The Fascination arcade owner moved his business (renamed Game World) to another Thor-owned property on Surf. 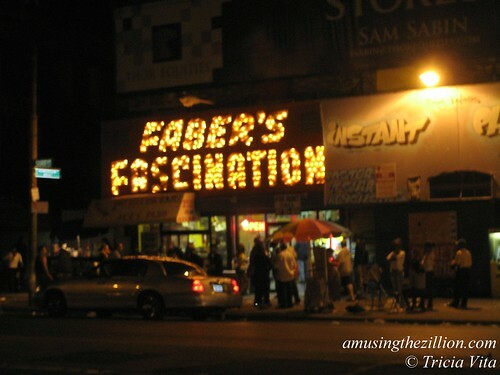 One of the saddest losses was the Fascination Arcade’s bare bulb sign which dated back to the 1930s. It was illuminated year-round and was a welcome sight to see upon exiting Stillwell Terminal. Also missed are the individually owned concession games like Shoot Out The Star, Balloon Raceing [sic] and the Balloon Dart on the Stillwell and Bowery sides of the building. 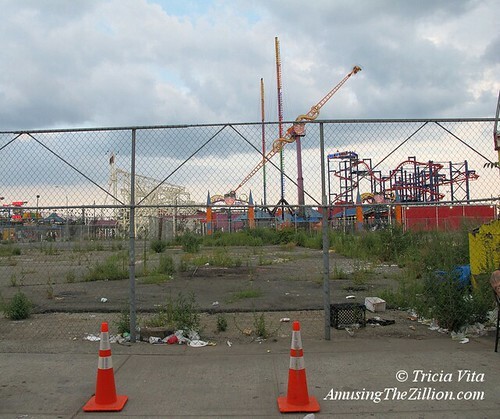 Is there anyone besides this former carny kid and game operator who is going to lament the fact that these old school amusements are gone forever from this corner of Coney Island? 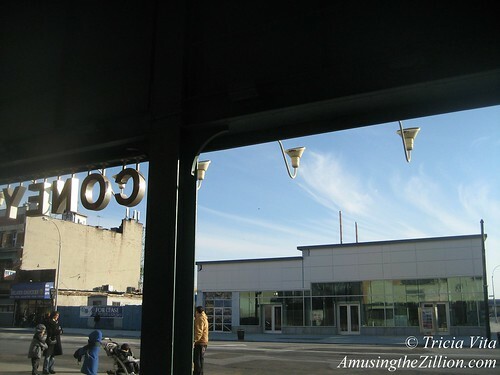 November 20, 2012: Coney Island Post-Sandy: Mini-Golf or Roller Rink to Replace Denny’s?